The story behind the quote: The quote comes from Alan Moore’s classic graphic novel, The Killing Joke. This comic drastically gives a different spin on the origins of The Clown Prince of Crime and turns it on its head. 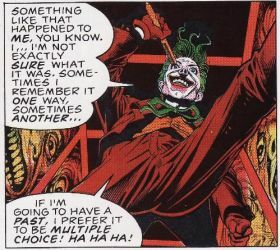 Basically, The Killing Joke tells the story of The Joker’s plan to kidnap Commissioner James Gordon and give him “one bad day” so he can go crazy like The Harlequin of Hate became after his stint as the Red Hood. Geek wisdom: Our brains have this weird way of clouding our very memories. Sometimes, we can remember something so vividly, we’d bet our life on it, only to find out we remembered it wrong. Other times, we can have fond memories of the past. But, when we revisit the same thing, we find out that it’s not as good as we remembered. This is not a bad, nor a good thing; it’s just a fact of life.